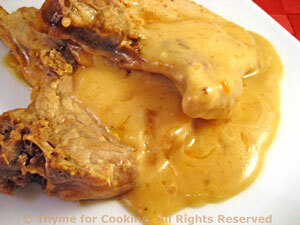 Pork Chops with Yogurt Mustard Pan Sauce, easy mid-week dinner. The chops are quickly browned then braised for 20 minutes to get fork-tender. They're finished with an easy, yogurt and mustard pan sauce. Heat oil in large nonstick skillet. Add chops and brown on both sides, about 10 minutes total. Add the beef broth, mustard, cumin and stir well to combine. Cover, reduce heat to low and simmer for 20 minutes, turning chops once. Remove chops, Stir yogurt into pan juices, spoon onto chops and serve. 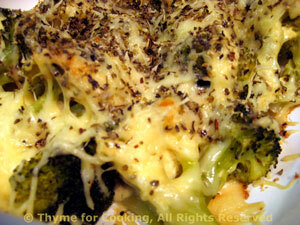 A simple preparation but the combination of mustard and cheese adds a creamy-sharp flavor to the broccoli. 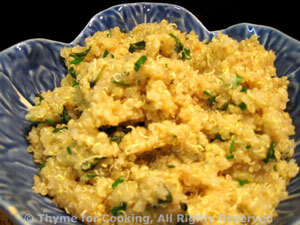 This can be made ahead and quickly reheated in the oven. Cut broccoli into bite size florets and stems. Put in a steamer basket in a saucepan with an inch of water in the bottom. Put on medium heat and steam for 10 minutes or until done. Mix cheese with bread crumbs. In medium bowl mix oil and mustard. Add broccoli and toss well to coat. Put broccoli in a small baking dish. Sprinkle with cheese mixture and bake, uncovered, at 400F (200C) until hot and golden, about 10 minutes. Serve.